It’s amazing how quickly Voyager found its routine. It seems like the show practically fell into a pattern that it maintained for the remainder of its run. 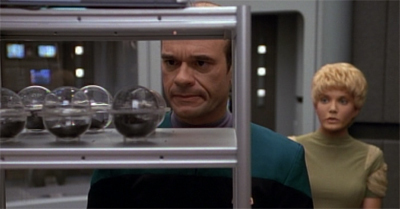 Parallax and Time and Again, the two episodes directly following Caretaker, feature two of the Star Trek tropes that Voyager would do to death in the years ahead. Parallax is essentially an anomaly-of-the-week story, where the crew investigates some weird space phenomenon and strange stuff happens; Time and Again is a reset-button time-travel episode. The problem is that both episodes really need to be something more. These are the first two episodes that feature our crew in what will become their status quo. The crew have destroyed the Caretaker’s Array and escaped the Kazon. The reality of the situation is dawning on them. They are likely to be in space for a very long time. It’s quite possible that most of the crew will die before they get home. 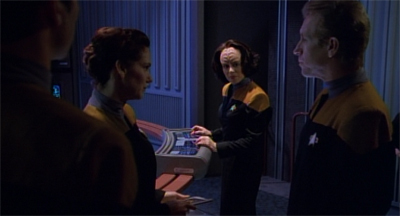 The Maquis are integrating into the crew. There’s perfect fodder for drama here. What I think everybody felt about Voyager was that it needed to be a ship show, it needed to be a lighter show, because people felt that Deep Space Nine’s downfall was that it was a little bit too dark. And I’m not sure I agree with that but I’m quoting, basically, my memory of the creative pressures at the time. The impact on Voyager from that philosophy was that we had a natural conflict between the Maquis crew and the Starfleet crew, but because people were worried that there was too much conflict on Deep Space 9, I think there was pressure to ease that and get this crew homogenised very quickly. I think we lost a creative opportunity by doing that. The one thing that I look back on and think would have made the series more interesting would have been to keep more conflict going between the Maquis and the Starfleet characters, at least during the first season or two. I think there was an opportunity missed early on to slowly create a group of characters that had to grow to know and trust one another. Because of those concerns, we essentially solved the conflicts and they were a pretty bonded crew probably from episode three or four on. He’s not alone in his assessment. 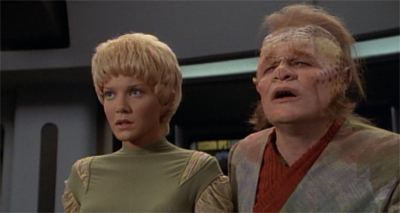 In his infamous exit interview from the franchise, Ronald D. Moore traced the bulk of problems with Voyager to the fact that every Maquis was in a Starfleet uniform by the end of Caretaker. Still, even if the network was breathing down the producers’ necks to get the Maquis into those uniforms, you at least had one episode to play with the concept. Parallax is about the Maquis integrating on Voyager – one Maquis in particular. 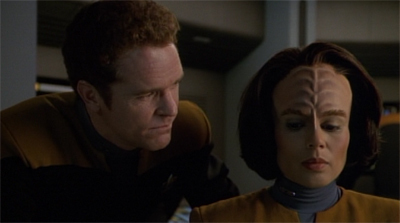 It stemmed from the fact that there wasn’t room in Caretaker to make B’Elanna Torres the Chief Engineer. So that had to be dealt with here, and the primary subplot of Parallax deals with Torres taking control of the ship’s engine room from presumptive Starfleet candidate Joe Carey. With that purpose in mind, this is an episode that relies on a lot of character work, a lot of development, a lot of nuance. It’s about the power dynamics on Voyager, and the compromises that need to be made in order for the ship to get home. 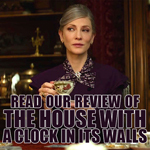 Unfortunately, that’s really not an episode that Brannon Braga was in any position to deliver. Braga is great writer of “weird science”, but he’s less good at character beats and inter-character drama. (That’s why his partnership with Moore typically worked so well.) This is the type of script that Michael Piller or Jeri Taylor really should be writing. The only thing about it is that the setup of Star Trek is that the Federation and Starfleet tend to assimilate everything to themselves. Even if you have these Maquis that aren’t Starfleet and they’re a little tougher, more sarcastic and nonperformers, maybe even mentally ill, you know once they get on that ship they’re part of Starfleet, even though they may argue about it once in a while. Look at Paris, they treat him a little too much like he’s a juvenile delinquent who needs to have his wrists slapped to get on the straight and narrow. As such, it seems like the creative team on Parallax was a bit of a creative miscalculation. The results certainly support that assumption. With support like these two, how could Janeway fail? This is the second episode of the season. The opened credits have not even rolled yet. Apparently there’s no room for development or arc-building. There’s no space for escalation. The Maquis appear to have been on the ship for about ten minutes, all in Starfleet uniforms and apparently all except Torres fitting in quite well. However, all of sudden the group are ready to mutiny and take over the ship? It’s an idea that seemed inevitable – so inevitable that the third and seventh seasons ran with it in Worst Case Scenario and Repression – but one that really needs a lot more space than “Chakotay’s pre-credits walk to Torres’ quarters.” This strains all sense of credibility, and it’s only made worse by the fact that the possibility is never mentioned again. Apparently, the Maquis are ready to mutiny at the drop of a hat, but also completely willing to forget about it if ordered. This is somewhat unsatisfying, but it’s par for the course here. In order to make Torres sympathetic, Joe Carey is presented as an unsympathetic entitled douche. Asked to recount the sequence of events that landed him in Sickbay, he explains, “I told her that would cause an overload. As usual, she wouldn’t listen. So I told her to step aside and let me handle it.” He does sound like a privileged douchebag. Later on, when preparing for a briefing, he warns Torres, “Just remember, Torres, I’m the senior officer and I speak for Engineering. Try not to say anything unless someone asks you a question.” I’d punch him. 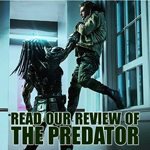 Given that Parallax opened with Torres punching another officer, her character arc should be quite clear. Accepting that Torres is a good engineer, she needs to demonstrate that she can play well with others. The problem is that Parallax is a Brannon Braga script. As a result, it doesn’t have a problem that can be solved by demonstrating an ability to work within a framework; it has a problem that involves some nice techno-babble, a pseudo-scientific set-up and a solid hook. Watching Parallax, it seems like Torres gets the job due to her technical know-how, which was never in doubt. And she has a point on any number of levels, the most obvious being that – if this is to be, as Caretaker suggested, a Starfleet mission – you need people who know Starfleet procedure in positions of seniority. Chakotay is offended by this position. “If you look at it that way, none of my people will ever have seniority.” Again, he has a point, but it doesn’t trump Janeway’s valid argument. 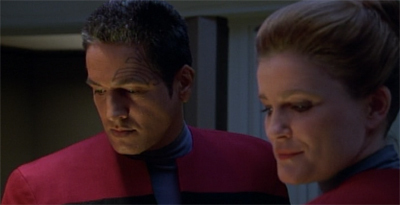 Chakotay’s objection is not unique to the Maquis. Based on the fact that this is effectively a seventy year mission, none of the crew who don’t already have seniority will ever have seniority either. Chakotay tries to land a low blow by refusing to be Janeway’s “token” Maquis officer. Again, this sounds like a fair argument. 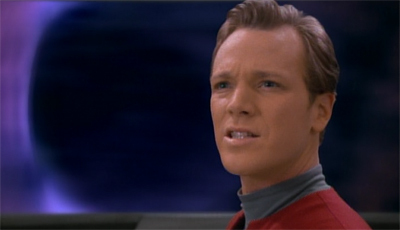 However, Chakotay is a qualified officer filling a vacancy that he is most qualified to fill. (The only other candid for the First Officer position would seem to be Tuvok, but he’s in the wrong division.) It’s the exact opposite of tokenism. On the other hand, putting Torres in a position of seniority because Chakotay wants another Maquis in a position of seniority feels more like tokenism. This really needs to be a bigger deal than it is. As it stands, it seems like Janeway has cynically bought the loyalty and cooperation of the Maquis crew with a token gesture. After all, none of the others are ever likely to make the senior staff. And it’s hard to believe that Starfleet officers are comfortable serving under the Maquis or that the Maquis would ever be comfortable working with Tuvok. In short, by trying to deal with all this in the subplot of a single episode, Parallax demonstrates how much bigger a deal this whole thing should be. And speaking of things that should be a bigger deal, Parallax sees the show make the smallest of nods to the fact that the crew are stranded on the other side of the galaxy. Kes plans to make herself useful by building a hydroponics bay, which gets a scene. However, the senior staff also discuss power management. After all, this is going to be a very long drive. They should probably figure out how to cut all power from all non-essential systems. However, Parallax features a scene which exists solely to justify any future holodeck episodes that Voyager may want to air. 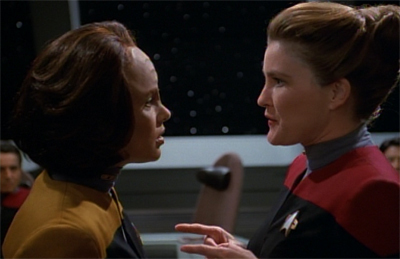 “Ensign Kim,” Janeway asks, “have you had any luck getting power from the holodeck reactors?” He replies, “Not yet. We tried hooking them to the power grid and we ended up blowing out half the relays. The holodeck’s energy matrix, it just isn’t compatible with the other power systems.” It’s an exposition scene that really should be used to explain how serious the situation is, but ultimately exists so that fans can’t complain about Heroes and Demons. And then there’s main plot. It’s clear that Braga is more interested in the nifty anomaly of the week than he is in any of the character drama unfolding around it. The notion of a ship answering a distress call from itself is a pretty cool concept, and the reveal that the alien ship is actually a mirror image of Voyager is somewhat clever. Asking Torres and Janeway to choose the right Voyager at the end of the episode is a passable climax, even if it feel a little bit contrived. However, this really feels like a concept recycled from the last few seasons of The Next Generation. It’s not too hard to imagine this as a companion piece to Parallels in the show’s final season. And it would have worked better there. 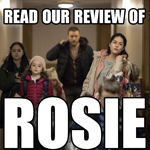 It would have worked better there because the high concept would have been supported by a cast who had grown into their characters, and whom the audience had already connected with. 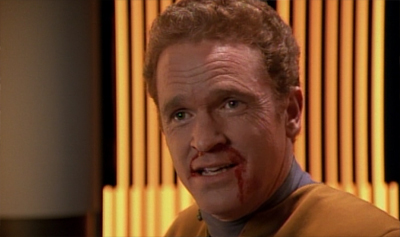 We know very little about any of the cast on Voyager, except for Tom Paris. So it’s hard for a generic space anomaly to get the audience on the edge of their seats; the worst thing this anomaly can do is destroy a ship full of people we don’t know. And most of the audience are at least shrewd enough to realise that it won’t even do that. So there’s no tension, no excitement, no engagement. It’s a concept that is vaguely interesting in the abstract, and becomes vaguely interesting in the execution. That said, Parallax does at least have some nice (if minor) character beats for Janeway. 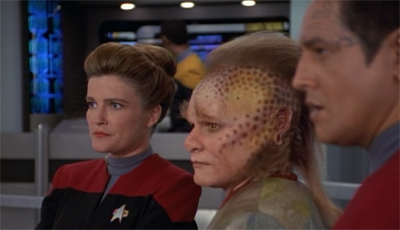 As compared to the other commanding officers, Janeway’s back story really points to her as a scientist. 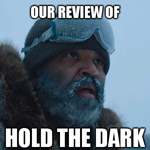 Caretaker referenced her history in the division. As such, it’s nice to see her geeking out over the anomaly, trying to conduct her own analysis. Her excitement at discussing the idea with Torres is a lovely character moment. Kirk may be an adventurer, Picard might be a diplomat; here, we get a sense that Janeway is a scientist. And it fits well. No matter how far Voyager goes, it just winds up back at the start again, looking at a strange spacial phenomenon. It’s as if Braga were staring into the future of the show, playfully parodying what it would become. 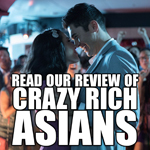 Unfortunately, it’s no joke – and Braga himself would wind up playing no small part in pushing the show in that direction. As such, Parallax helps to set the tone for the years ahead, just not in the way that the show might have wanted. It’s amazing how quickly Voyager abandoned the promise of its premise, and instead embraced a storytelling model it would stick with for the rest of its seven-year-run. Sadly, that doesn’t make Parallax an enjoyable experience; just an interesting one. “Lumber support” – hehe! Chakotay jokes are predictable but make me snicker nonetheless. 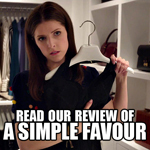 I have noticed that most VOY reviews tend to bring out the ‘bitchy’ in reviewers, and that’s why they’re my favorites. The problem with Voyager is that a lot of the problems are obvious, and a lot of the problems are repeated, and a lot of the problems are ignored so often that they become almost part of the show. 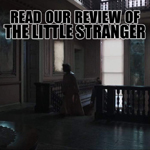 There are so many weird dysfunctional elements to the show and the production, that it’s hard to watch it or discuss it without adding all sorts of clauses and qualifications. Another area where Brannon Braga falls down is that he’s stronger on theory than in execution. Cause and Effect, Frame of Mind and Parallels are all terrific high-concept ideas that worked beautifully, but there have been others that didn’t pan out, like Genesis because of the ludicrous science Braga used to get the premise to work (it didn’t). He’s a classic example of the author who has an idea but no concept of forward-planning. That’s a fair point. And it’s certainly the case with the third season of Enterprise, which is very much the magnum opus of his time on Star Trek. The first third of the season is spent with the staff effectively figuring out what the hell they’re going to do, only really settling into a groove around the half-way point. It is interesting that the more tech-heavy episodes are thought to be a perfect fit for Voyager rather than DS9. In the early days of DS9, that show did rely on some high-conceptual ideas and found itself accused of being TNG-lite. This is a valid criticism but the series eventually discovered that where it really worked was focusing on strong character-centric stories and the deconstruction of Gene Roddenberry’s utopian human universe. This sort of thinking was much more intermittent on Voyager and TNG-lite is exactly what it became on far too many occasions.